KIEV, Ukraine -- The standoff between Kiev and Moscow has reached food stores in the Ukrainian capital, where Russian-imported goods are soon to be marked with special labels. 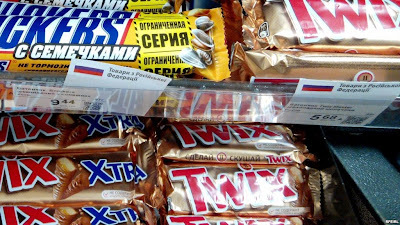 Some shops use more elaborate printouts featuring a Russian flag to identify products that have been imported from Ukraine's eastern neighbor. The Kiev city legislature has approved legislation ordering stores to enforce the new measure, which its initiator, lawmaker Ruslan Andriyko, says aims at warning consumers against supporting the "aggressor" by purchasing Russian products. "Every kopek sent to Russia," Andriyko told RFE/RL, "is spent by [Russian President Vladimir] Putin on weapons that kill our soldiers." 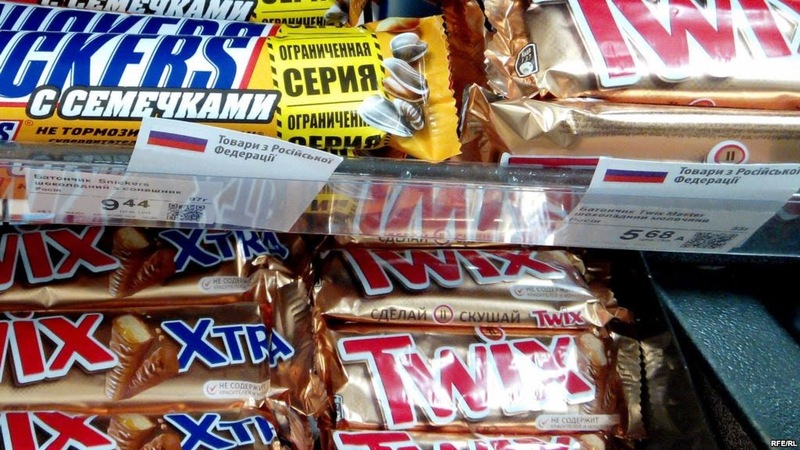 Under the new rules, Russian-made goods will also have to be displayed on separate shelves. Andriyko says supermarket and store owners overwhelmingly back the measure, which he pledges will not hurt Ukraine's economy. "Enacting this decision won't put any burden on the budget, it won't result in any losses for sellers," he says. "Technically, it can be done in one day, just by marking products made on Russian territory with a little flag or a similar sign." Stores will be given a month to introduce the changes. After this "adaptation" period, checks will be conducted to make sure retailers are complying. Stores caught flaunting the new rules will not be fined but, according to Andriyko, city authorities will "strongly insist" on the need to follow the new recommendations. "I'm sure this measure will be implemented without any coercion," he said. The idea, in fact, is not new. Similar steps have been taken by local administrations in Lviv, Ivano Frankivsk, and Cherkasy. Many shops in these three Ukrainian cities are already using various markings -- some simple hand-made labels saying "Russia," others more elaborate printouts featuring a Russian flag -- to identify Russian products, which range from yogurts to chewing gum, chocolate bars, or children's diapers. In Lviv, volunteer brigades have also been deployed to enforce the move. Activists from the Economic Boycott Movement, among others, routinely inspect stores to chastise reluctant shop owners and inform consumers about the alleged danger of buying Russian products. Some Ukrainians, like social psychologist Viktor Pushkar, have voiced unease about the new rules and warned against the pitfalls of propaganda. "We already have this experience from the end of the 1980s and the beginning of the 1990s, when propaganda was conducted by unprofessional people," he cautions. "In my opinion, instead of fostering pro-Ukrainian feelings they discredited the notion of nationalism." But so far, the initiative has encountered no real public resistance. "Most products don't have Russian barcodes, and people are not in the habit of reading these small numbers on the packages anyway," says Yekaterina Chapura, an activist in Kiev. "So it would be very useful if products were marked." In addition to the marking of Russian-made goods, the new ruling also recommends that media outlets create a new column titled "Down with the Russian Occupiers," and that Ukrainian television and radio broadcast patriotic songs. It also calls on schools to introduce new lessons on "the aggression against Ukraine, a manifestation of fascism and chauvinism."